The Tudors’ impressive run to the last-16 of the country’s elite non-league cup competition came to a juddering halt at Vauxhall Road last Tuesday night when National League high-fliers Solihull Moors triumphed 5-0 in a scoreline that didn’t truly reflect how Hemel battled, especially in the first period. Now Tudors’ boss Joe Deeney faces a tough run-in, with a fixtures pile-up seeing seven games in just over three weeks, including three Tuesday-and-Saturday clashes. In this crucial spell, Hemel will face four sides inside the top-six in the table and six in the top-12 positions. That starts with a difficult home clash with table-toppers Torquay tonight (Tuesday). Hemel then have a more winnable prospect on the road at 17th-placed Dulwich Hamlet this Saturday. Last Tuesday’s cup tie at Vauxhall Road had been re-scheduled from the previous Saturday after snow and ice forced a postponement. Terry Hawkridge notched his first goal for Moors, while Adi Yussuf netted either side of the break and Jermaine Hylton added two more late on to give Moors a flattering result. In the end it was a lesson in finishing and Solihull look a decent bet to progress all the way in the competition. The score didn’t tell the story of the game but it was a harsh reminder of how tough it is in the National League. Hemel still have a way to go before they can compete with the big boys but it’s still a work in progress and they should be proud of their efforts. The Tudors must now put that disappointment behind them and redouble their efforts in the National league South, with their exploits in cup now finding them in 14th spot in the league standings. 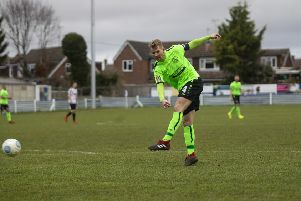 They have as many as three games in hand on some of the teams around them and one of those clashes was due to take place last night (Tuesday) as the Gazette was going to press when league leaders Torquay United were visiting Vauxhall Road. The return to league action resumed on Saturday when the Tudors visited mid-table Chippenham Town on a boggy and bobbly pitch at Hardenhuish Park. Despite the hosts dominating large parts of the first period, Jordan Parkes gave Hemel a surprise lead on 33 minutes with of a well-taken counter attacking finish for his ninth goal of the season in all competitions. However Nick McCootie equalised for Chippenham 10 minutes into the second half. The hosts could not find a winner as Hemel scrapped for a point. The Chippenham boss Mark Collier felt his side outplayed Hemel and produced some of their best build-up play he had seen all season – only good keeping from Laurie Walker and a lack of cutting edge in front of goal cost them all three points, he said after the game. Hemel line-up v Chippenham: Laurie Walker, Kavan Cotter, Joe Howe, Jordan Parkes (captain), Darren Ward, Frankie Musonda, Herschel Sanchez Watt, Scotty Shulton, Steve Cawley, Jack Snelus (Arel Amu, 56 minutes), James kaloczi. Subs not used: George Paulin, Ollie Swain, Ismail Yakubu, Leon Lobjoit and Jacques Kpohomouh.